Apple's iPod nano​ was the perfect intermediate device, sitting right in the​ middle of the iPod line and offering a combination of performance and features and low price. The iPod nano doesn't offer a big screen or big storage capacity like the iPod touch, but it's got more features than the Shuffle (plus, unlike the Shuffle, it's got a screen!). The nano has always been a lightweight, portable MP3 player, but has added features include video playback, video recording and an FM radio over the years. While this has made the nano much more like its competitors (which long used FM radio tuners to differentiate themselves), it's still one of the best portable music devices of its kind. Read on to learn all about the iPod nano, its history, features, and how to buy and use it. 1st Generation iPod nano: The original model offered a small color screen and 1 GB, 2 GB, and 4 GB storage capacity for audio. Also known as Apple model number A1137. 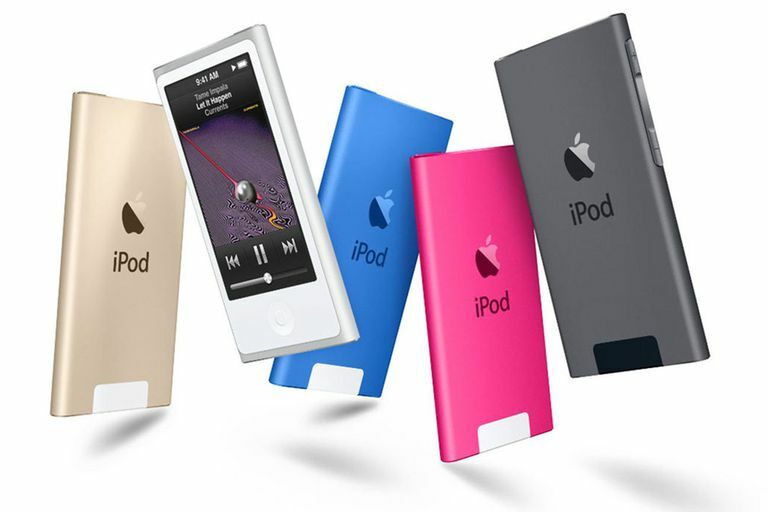 2nd Generation iPod nano: This model doubled storage capacity—2 GB, 4 GB, and 8 GB—and brought bright case colors to the nano line. ​Also known as Apple model number A1199. 3rd Generation iPod nano: ​A big change to the nano with its squat form factor and video playback. Models offered 4 GB and 8 GB capacity. Also known as Apple model number A1236. 4th Generation iPod nano: A return to the vertical form factor, with capacity raised to 16 GB at the high-end, and nine brightly colored models. Also known as Apple model number A1285. 5th Generation iPod nano: The same form factor as the 4th generation model, but it added a video camera and FM radio tuner to create a versatile, capable iPod. ​Also known as Apple model number A1320. 6th Generation iPod nano: A major redesign in shape and functionality. This model added a multitouch screen, removed video playback and the video camera, and changed how you use the nano in ways some users didn't like. Also known as Apple model number A1366. 7th Generation iPod nano: Another major redesign, also the last iPod nano model. The 7th generation model added a big touchscreen and a home button, making it look like a shrunken iPod touch. It also restored video playback and added support for Bluetooth headphones and speakers. Also known as Apple model number A1446. Screen: A 2.5-inch multitouch screen, rectangular in shape. Touchscreen: Like its predecessor, the most recent nano has a touchscreen for controlling it (no more Clickwheel on any nano models). Like the iPhone and iPad, it offers a multitouch screen to control the device. Memory: The iPod nano uses solid-state Flash memory to store music, video, and other data. Accelerometer: Fourth, Fifth, and Seventh generation nanos include an accelerometer like in the iPhone and iPod touch that allows the display to automatically re-orient itself based on how the nano is held. FM Tuner: The Fifth, Sixth, and Seventh generation models sport an FM radio tuner ​that allows users to listen to and record radio, as well as tag favorite songs for later purchase. Bluetooth: Connecting to wireless headphones and speakers is supported on the Seventh generation model using this close-range wireless technology. Lightning Dock Connector: The Seventh generation nano uses Apple's Lightning dock connector for syncing with computers, the same small port used on the iPhone 5 and up. All previous nano models used Apple's Dock Connector port. Is the iPod nano, or another iPod, right for you? How can you find a cheap iPod nano (other than buying used)? What accessories should you buy with an iPod nano? Are you interested in the AppleCare extended warranty? If you bought an iPod nano to upgrade from another iPod or MP3 player, there may be music on your old device that you want to transfer to your computer before setting up your nano. There are a few ways to do this, but the easiest is probably by using third-party software. You’ll also want to take precautions with your nano and yourself, such as avoiding hearing loss or theft, and how to save your nano if it gets very wet. After a year or two, you may start to notice some degradation of the nano's battery life. When that time comes, you’ll need to decide whether to buy a new MP3 player or look into battery replacement services. How Does the iPod Clickwheel Work? Early versions of the iPod nano used the famous iPod Clickwheel for clicking and scrolling on the screen. Learning how the Clickwheel works will help you appreciate what a great bit of engineering it is. Using the Clickwheel for basic clicking simply involves buttons. The wheel has icons at its four sides, one each for menu, play/pause, and back and forward. It also has a center button. Beneath each of these icons is a sensor that, when pressed, sends the appropriate signal to the iPod. Pretty simple, right? Scrolling's a bit more complicated. The Clickwheel uses a technology similar to that used in touchpad mice on laptops (while Apple eventually developed its own Clickwheel, the original iPod Clickwheels were made by Synaptics, a company that makes touchpads), called capacitive sensing. The iPod Clickwheel is made up of a couple of layers. On top is the plastic cover used for scrolling and clicking. Beneath that is a membrane that conducts electrical charges. The membrane is attached to a cable that sends signals to the iPod. The membrane has conductors built into it called channels. At each place where channels cross each other, an address point is created. The iPod is always sending electricity through this membrane. When a conductor—in this case, your finger; remember, the human body conducts electricity—touches the click wheel, the membrane tries to complete the circuit by sending electricity to your finger. But, since people probably wouldn't like getting shocks from their iPods, the plastic cover of the touch wheel blocks the current from going to your finger. Instead, the channels in the membrane detect what address point the charge is at, which tells the iPod what kind of command you're sending to it via the Clickwheel. While the iPod nano was a great device for many years and sold millions of units, Apple discontinued it in 2017. With the rise of the iPhone, iPad, and other, similar devices, the market for dedicated music players like the nano had shrunk to a point where it didn't make sense to continue the device. The iPod nano is still a great device and easy to find, so if you want to get one, you should be able to get a good deal and use it for years to come.